Paudel, B., N.B. Weston, J. O’Connor, L. Sutter, and D.J. Velinsky. 2017. Phosphorus dynamics in the water column and sediments of Barnegat Bay, New Jersey. Journal of Coastal Research 78: 60-69. Kearns, P.J., N.B. Weston, J.L. Bowen, T. Zivkovic, and M.A. Vile. 2016. Tidal freshwater marshes harbor phylogentically unique clades of sulfate reducers that are resistant to climate change induced salinity intrusion. Estuaries and Coasts. In press. Sutter, L.A., N.B. Weston, S.T. Goldsmith. 2015. Hydraulic fracturing: Potential impacts to wetlands. 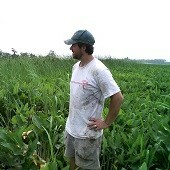 Wetland Science & Practice. 32: 7-16. Giblin, A.E., C. Tobias, B. Song, N.B. Weston,, G.T. Banta and V. Rivera-Monroy. 2013. The importance of dissimilatory nitrate reduction to ammonium (DNRA) in the nitrogen cycle of coastal ecosystems. Oceanography 26: 124-131. Joye, S. B., W. P. Porubsky, N. B. Weston, and R. Y. Lee. 2003. Benthic microalgal production and nutrient dynamics in intertidal sediments. In: Rullkotter, J. (Ed. ), BioGeoChemistry of Tidal Flats, Proceedings of a Workshop held at the Hanse Institute of Advanced Study, Delmenhorst, Germany, May 14-17, 2003. Forschungszentrum Terramare Berichte 12: 67-70. Weston, N.B., Hollibaugh, J.T., Sandow, J., and Joye, S.B., 2003. Nutrients and dissolved organic matter in the Altamaha river and loading to the coastal zone. Proceedings of the 2003 Georgia Water Resources Conference, held April 23-24, 2003, at the University of Georgia. Kathryn J. Hatcher, editor, Institute of Ecology, The University of Georgia, Athens, Georgia. Schmitt, C., N. Weston and C. Hopkinson. 1998. Preliminary evaluation of sedimentation rates and species distribution in Plum Island Estuary, Massachusetts. Biological Bulletin 195:232-233. Weston, N., S. Carini, A. Giblin, G. Banta, C. Hopkinson and J. Tucker. 1996. Estimating denitrification in sediments of the Parker River estuary, Massachusetts. Biological Bulletin 191:334-335. Carini, S., N. Weston, C. Hopkinson, J. Tucker, A. Giblin and J. Vallino. 1996. Gas exchange rates in the Parker River estuary, Massachusetts. Biological Bulletin 191:333-334.